The foxtail family is a family of plants in Pikmin 2, and is consisted of solely one element, the eponymous Foxtail. It's based on the real-life poaceae family. 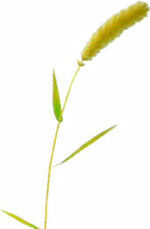 The Foxtail is a plant found only on the Valley of Repose and the Wistful Wild, and the Sniper Room. It is only used as decoration, and is considerably large in size. This page was last edited on February 8, 2016, at 12:44.